~~SOLD~~ ** Price reduction as of January 20, 2018: Was $249k reduced to $200k ** 	Hammock time on the balcony 	Sipping a cocktail at the poolside bar 	Enjoying the shade under the pergola 	Grilling your fresh catch on the bbq 	Entertaining your friends in the outdoor dining area 	Unwinding on the porch with a good book and a cerveza 	Family meal time inside the open concept american style kitchen 	Early morning walk to town in search of fresh fruits & veggies 	Adding to your growing sea shell collection 	Evening stroll along the shoreline 	Listening to the waves rolling in, off in the near distance The to-do list is endless. When will you ever find the time? Right here, right now. Welcome to your Ecuadorian dream. We have the keys to make it a reality. Contact us for a showing of this fantastic opportunity. At this price, it will not last long. 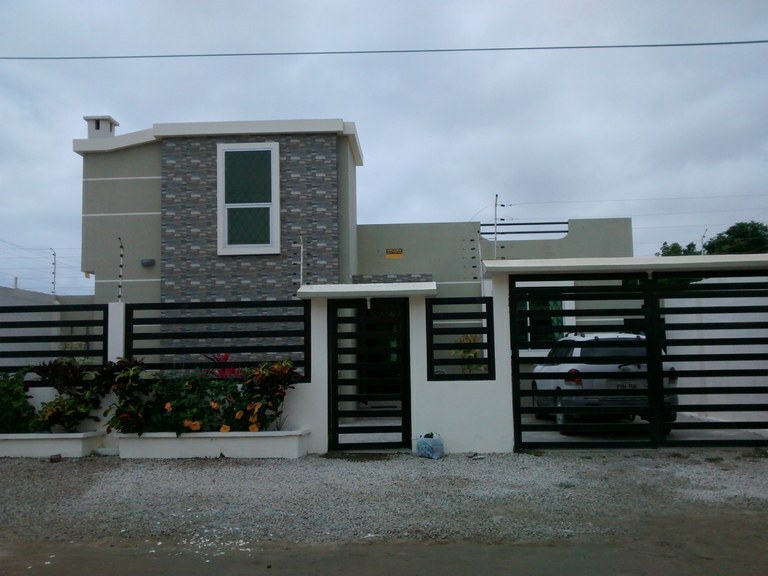 **SOLD as of AUG 25, 2018** Ballenita is a beautiful beach town of located all of 20 minutes north of Salinas, in between the road to Guayaquil and the junction of a local national highway known as the Ruta de Spondylus. Ballenita is now home to a brand new strip mall with a huge national grocery chain store, a new inter-provincial bus terminal, and is currently undergoing major rehaul of the Malecón (boardwalk). The expat population here is on the small side, but showing consistent growth as the amenities keep improving. This town is quite populated by local Ecuadorians making it a nice place to submerge yourself into the culture without feeling overwhelmed. This property is unique in that although it is set back a bit, it is considered oceanfront. It is perched on a hill so you can overlook the beach activity below, or head down the public stairwell for some toes in sand time. At the far end of the property there is a large open patio area that currently is home to many beautiful plants and some palm trees. There is also a nice jacuzy. 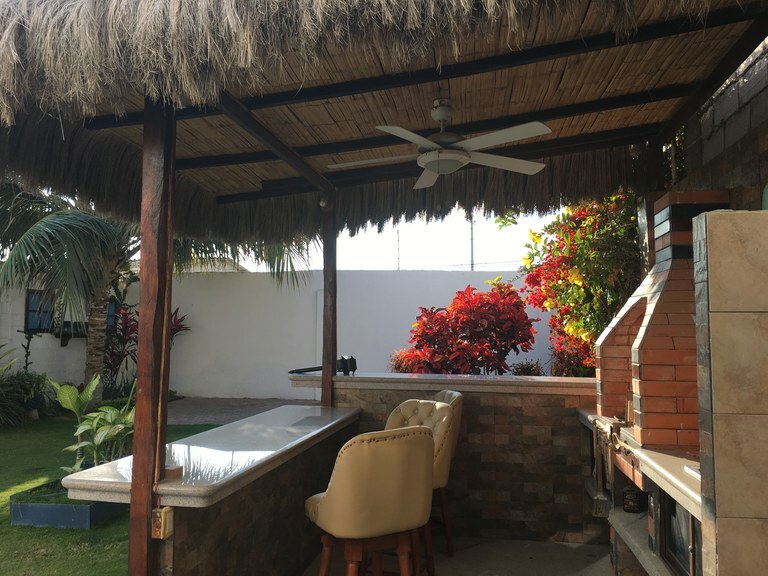 Next to the jacuzzy area is a great outdoor sitting area with wetbar and bbq space, all covered by a nice blanket of bougainvillea on the pergola. There is also an outdoor bathroom and shower, great for when you are entertaining guests. The house itself is a two story and was remodeled in 2005. Downstairs there is a huge living room which connects with the open concept kitchen by means of a large breakfast bar/island which is great for meal prep or in lieu of a dining room table. The kitchen is a nice size with room for many large appliances; checkout the cool green tile backsplash behind the stove!! The master bedroom is located downstairs with lots of excellent built-in closet space and a huge on-suite full bath with massage-jet bathtub and nice glass block accent window. Upstairs there are 2 more bedrooms which share a large full bathroom. There is a small romeo-juliet type balcony facing the street. However, off to the other side, there is an entrance to the rooftop terrace which is enormous. This area could be used for almost anything and is great for views and breezes or even just sun tanning. Relocation to Ballenita is quite simple and we can help you with all your needs, from shipping your household goods and/or pets, to immigration and visa issues, to helping you with healthcare insurance options, to opening up a local bank account. All you have to do is pick the property and we’ll take care of the rest. In essence, we have the keys to your Ecuadorian dreams!! Ecuador: Don’t let it be just a dream!!! **PRICE REDUCED** Oceanfront home directly on the beach!! **WOW!!!! BIG PRICE REDUCTION!!! FROM $300k to $254,500k** Custom-designed oceanfront home built for a King and his Queen! 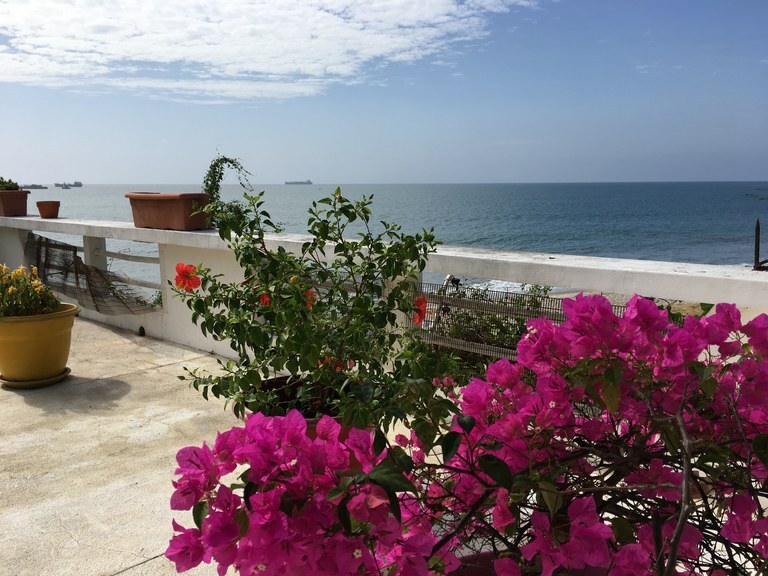 Living in the quiet fishing village of Puerto Cayo is nothing short of fantastic. The only way to make it better is to be living in this custom-built dream home directly on the water!! Puerto Cayo is a small yet popular expat destination located all of 45 minutes south of Manta, a large port city which offers north-american style shopping and a national airport. 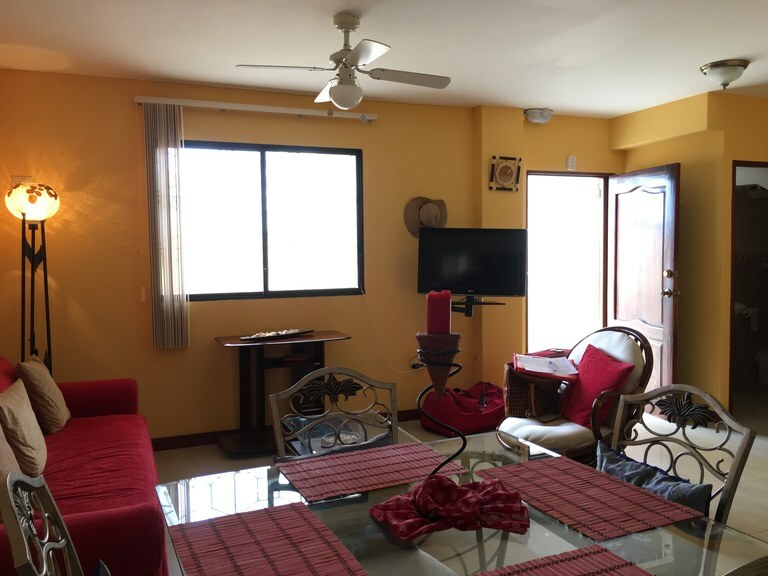 This two-story, 1500 square foot home is located on a lot that is 1250 square meters, with a large amount of beach frontage (25 square meters). The home was designed and subsequently built back in 2014 by the current owners. There are 2 bedrooms, 3.5 bathrooms, kitchen, living/dining area, office, and attached garage with laundry and storage. The open-concept american style kitchen features custom cedar cabinets (North American with granite counter tops and under mount sink. The kitchen has a sidebar with additional storage with matching granite and cedar cabinets. The cabinets have North American style ball-bearing tracks for the drawers. There are corner drawers and pull out drawers. From the kitchen there is access to a large covered marble patio via sliding glass doors which provide access to a beautifully landscaped beach-front yard complete with grass, flowers, palm trees, pavers and steps that lead you directly to the sand. Also located downstairs is an office area and powder room for guests. On the second floor are the two bedrooms, the first houses a custom made queen sized bed with two matching end tables. The room has a marble floored closet with security lock and an on-suite bathroom complete with shower, toilet and sink. The Master bedroom has custom cedar floor to ceiling his and hers wardrobes. The custom made California King-sized bed matches the wardrobes and the master bathroom vanity. The walk-in shower has glass blocks and is encased with slate. There is a wet bar and full bath incorporated into the upstairs media room. A sliding glass door provides access to a full 19 X 10 foot, marble-floor, ocean-front balcony. The house has a walk out roof top terrace. The lot is 50 meters by 25 meters. There is 25 meters of beach front. The house is grandfathered in so it sits 25 meters from the water. 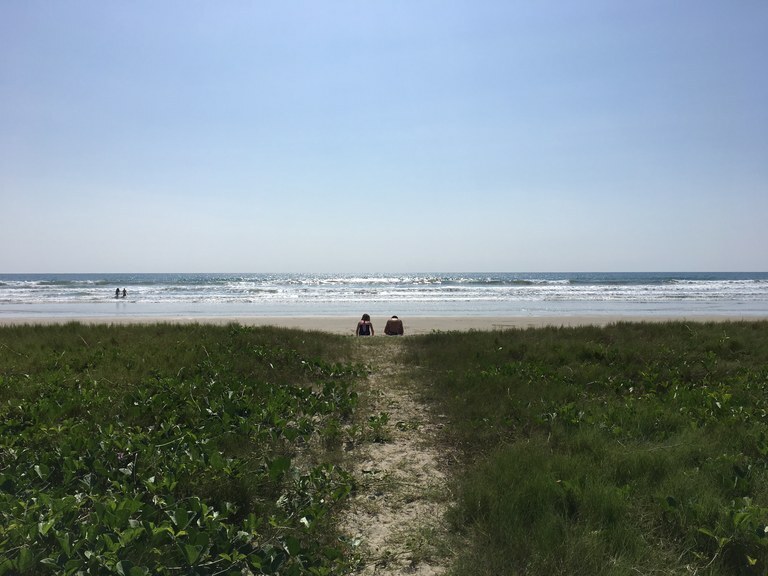 The ocean is a short 50 steps from your back door! There is a 1 meter boulder beach wall the length of the property. The lot features 25 meters x 12 meters of pavers on the beach side, which is great for tables and chairs and entertaining. The yard has grass, palm trees, almond trees, and lots of flowering bushes. Electric: The house is wired and grounded to North American standards. There is a master shut off breaker and the generator. The 5500 watt generator conveys with the house. Septic: The septic is built North American style. You can flush your waste paper. A company based in Manta will clean the septic with a simple phone call. Water: The cistern is oversized and holds 1.5 tankers of water. The tankers have access to the water inlet from the road. The entire house is on a water filtration system, such that every faucet provides filtered water. The reverse osmosis water and UV light system is available at the kitchen sink for even more pure drinking water. Water tanks are $30 per tank. There is hot water in both the house and the casita. The house on-demand hot water tank is gas; the casita is electric. The house has internet, and direct TV. Being offered Furnished. Located in the renowned community called Lobster Bay, on the cliffs of Ayangue, this gated community has developed into one of the most sought-out in the area. 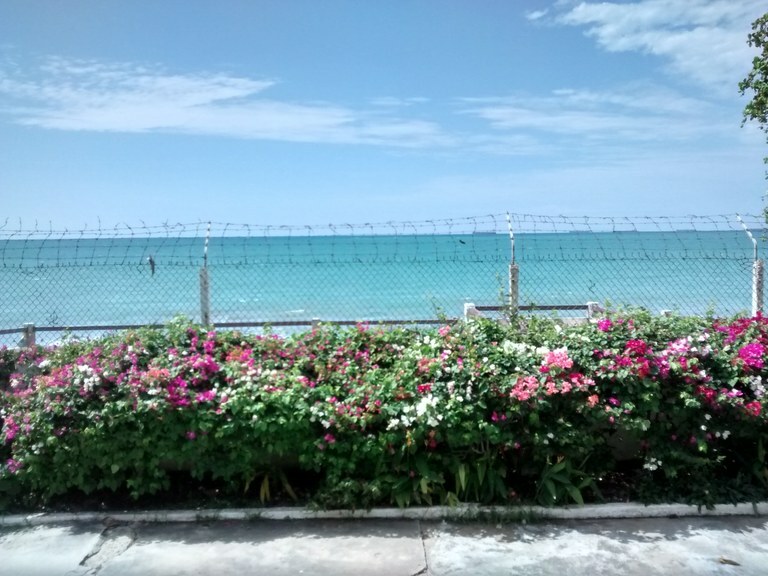 The town of Ayangue is locally known for its lobster, which can be enjoyed from one of the many eateries located on the newly renovated Malecón. Ayangue boasts a great beach in a cove-like setting as the bay protects the beach from the open pacific. Snorkeling and scuba are popular here year-round. This custom-built two-story home was finished in 2015 and has hardly been occupied. Crisp, clean, modern design in an ocean setting with beautiful sunsets and breezes daily. 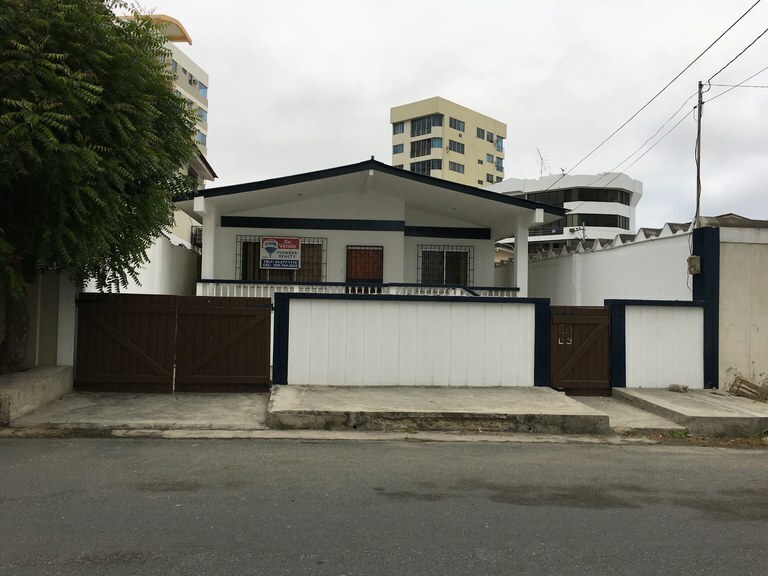 With over 2000 square feet of living space, this 3 bedroom, 2.5 bathroom sits on a 1000M2 lot with gated security wall and parking ample enough for 3 vehicles or to even put in a pool. On the ground floor the main entrance opens up to the open concept living/dining kitchen area with fantastic bay windows right as you walk in. The modern kitchen boasts a middle island and a huge pantry. The downstairs bedroom is enormous and has a large en-suite bathroom, walk-in closets and access to the back porch. There is a half bath downstairs as well. Upstairs are two guest bedrooms one of which has its own private balcony, a shared full bathroom, and views to the downstairs living area from the hallway. There is also access to a great rooftop terrace for bbq and entertaining. Custom designed to American standards using top finishings such as granite countertops and porcelain floors. Ready for you to move-in. Being sold furnished. Fabulously maintained 2-story home. 3 bedrooms, 2 1/2 baths. Fully furnished. Located in a quiet area of Chipipe. Call to schedule a showing!!! Great beach house in Salinas: Just one block from the beach!! This one-story house is the perfect retirement spot!! Come to Salinas to enjoy peace and quiet in this great residential neighborhood only one block from the beach. 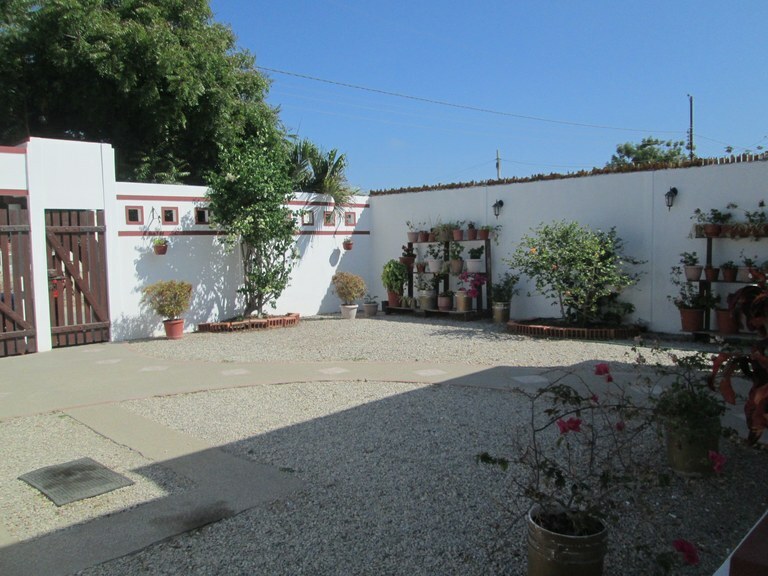 The house is located in the San Lorenzo section of Salinas, really close to many restaurants and walkable to all. The house has 3 bedrooms and 2 full bathrooms, a living room, dining room, kitchen, washroom and maid’s full bath. The property is being sold with the furnishings. There is a nice small backyard where a papaya tree has already given fruit; this area could make an excellent garden or bbq area. The front deck is quite large and runs the entire length of the house. The garage area can hold several vehicles or could double as an additional patio. With just a little bit of love, this property can be a fantastic home away from home!!! When you think back to the days when you would go to the beach with your family on vacation, think of this place. This split-ranch style home is just that: a traditional beach home with plenty of rooms for the entire family to relax and spread out. This home is even better than that - this is directly on the water, in a fantastic neighborhood with nothing but breezes and sunshine to help you pass the day. One of the best things about this house besides the great mature landscaping and fantastic outdoor space is a huge covered front deck which leads down to a patio area, where you can find a door direct to the beach below. You will spend all your time on this outdoor deck, guaranteed. The home itself is about 2000 square feet and consists of 5 bedrooms and 4 full baths. There is a spacious living/dining area leading out to the deck. There is a separate kitchen off the dining room. 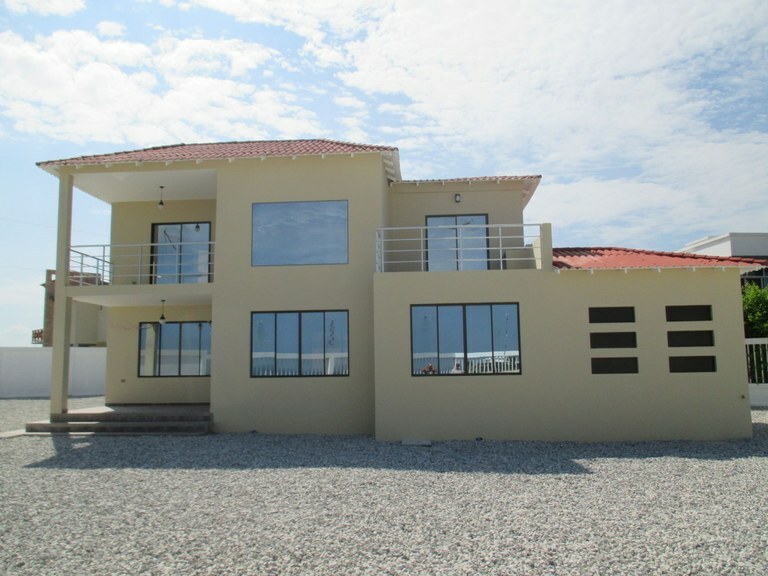 The lot size is 900 square meters, 30 x 30, giving you lots of ocean frontage. Love This House: This is truly a home! A move-to-Ecuador and just bring my suitcases kind of home. Cozy and Comfortable. Spacious and Quiet. A nice blend of old with new. Excellent outdoor space with a huge lot. Only 2 blocks from the beach. Built in the mid-80's yet renovated in 2015 and updated in 2018, this two-story home boasts lots of natural light, ventilation and a great layout, with approximately 2000 square feet of living space. Downstairs there is a huge living room with sliding glass doors which open to the outdoor patio; a dining room large enough for a table to seat 8, again with sliding glass doors opening to the outdoors; a half bath; and a huge open concept kitchen with middle island. This gourmet kitchen probably has the most marble counter-space in all of Salinas!! Not-so-common features include the double oven, double sink and dishwasher, as well as a pantry tucked away to one side and a breakfast nook to the other. Upstairs the entire floor has been recently re-done throughout. Here is where you will find the three bedrooms, two full baths and a laundry room. There is a small balcony off of one of the back bedrooms. The master has an en-suite bath as well as great walk-in closet. Perhaps the best feature of this home is not the home itself, yet perhaps the outdoor areas. 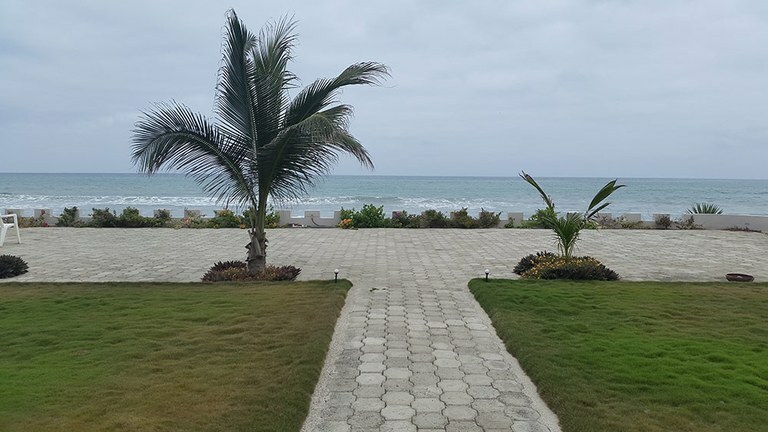 Located on a lot that is 500 square meters, the exterior includes several manicured areas where there are a perfect blend of mature palm trees with buganvilla, copa de oro and other indigenous colorful plants all impeccably maintained. A covered bar/bbq area, two separate seating areas, a fire pit, and an enormous driveway which can easily be used for a pool or jacuzzy or both, a sporting area or just a great space to host a huge party. The house is being sold un-furnished. Great beach home in Salinas, 2 blocks from the ocean! Just two short blocks from the boardwalk of La Milina in Salinas you can live in peace and quiet. This home, built just about 6 years ago is a great find!! The home has a fantastic rooftop terrace with BBQ area from which you can see a view of the ocean down the street. The home can accommodate an additional story in the event a second level were needed or if rental suites were of interest. The living area of the home itself is on the lower level, nicely distributed with lots of room to move around, nice breezes and plenty of light. There are 3 large bedrooms each with closets and own split air conditioners plus 3 full bathrooms. The master bath is enormous and is unique in that it has a great skylight ceiling. There is also a large living room, separate dining area, and a recently remodeled open concept kitchen (porcelain counter-tops, upper and lower cabs, peninsula breakfast bar, sink plumbed for hot water) with a huge separate walk-in pantry. Through the living room there is access to the back patio but first you must pass through a covered cozy outdoor seating area. The back patio is very large with beautiful buganville flowers, an excellent spot for relaxing, sun bathing or a great area for your dogs. There is a front patio area if you are not using it to park vehicles, otherwise up to 3 small vehicles could be easily accommodated. An outdoor laundry room was just recently added for easy access and additional storage. The home is being sold UN-furnished. Impeccable one-story home, 2 blocks from the beach! This is a gorgeous home in a quiet neighborhood of Salinas, only a 2 block walk from the beach. All on one level, this home has approximately 1300 square feet of living space. There are three bedrooms, two full bathrooms, open concept kitchen, living room and dining area. The best part is the large front balcony area used for an outdoor seating area and hammock time. The lot is 350 square meters, all of which has been paved with wither stone or tile or cement or a mix thereof. The perimeter walls have been completely finished and painted on the inside and there are several areas for plants and trees. The front patio area can easily fit 3 cars. The back patio area is where you will find a fully equipped one bedroom suite with its private full bath, a separate laundry room, as well as separate tool shed/storage room. The grounds as well as the home itself are in excellent condition and are under constant maintenance. Being sold UN-furnished.